Xiaomi is gearing up to launch the Mi 6 flagship smartphone in Pakistan soon. Additionally, Mi Max 2 as well as other Mi Eco products are also going to be launched in the same week. Their official Facebook page – known as Mi Pakistan – has hinted that they are launching Xiaomi Mi 6 very soon. They have not given a definite launch date but sources say that they are expected to be launched in the last week of August in all probability. They have also hinted at several other accessories and products including air purifier, car charger, VR headset, desk lamp etc coming to the Pakistani market as well. This only means that Xiaomi is preparing to launch several of these products alongside the Mi 6. With Eid-ul-Azha coming up it seems like a good time to launch new products in Pakistan, just in time for celebrations. Xiaomi Mi 6 comes with a 5.15 inch 1080p display, Qualcomm Snapdragon 835 processor and 6 GB RAM. The phone has glass on the front and back with a steel frame covering the sides. Xiaomi claims that the the body is manufactured in 12 days using 40 different processes. It also has 12 MP dual cameras with a wide angle and telephoto lens. Other camera features include 4-phase optical image stabilization, phase detection autofocus and a dual LED flash. A 3,350 mAh battery powers the Mi 6 with Qualcomm Quick Charge 4.0 support. The company has been seeing a lot of success in the wearables and smartphone department recently. After losing quite a lot of market share last year, Xiaomi has reclaimed their spot among the top 5 smartphone makers in the world. 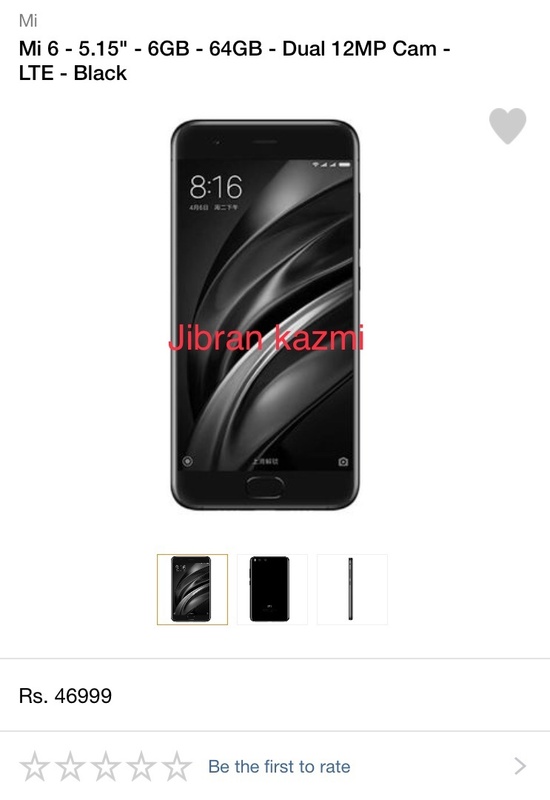 Xiaomi’s official Mi Pakistan website has been updated with countdown timers for Mi 6, Mi Max 2 and other products (note: screenshots were taken at the time of writing and may not match with the current time). Xiaomi Mi 6 will be officially available on Monday 21st August at 12 am (night). Xiaomi Mi Max 2 will be available on Thursday 24th August at 12:30 am (night). Accessories will also launch alongside Xiaomi Mi 6 due to similar timer durations. There has been a lot of demand for the new Xiaomi flagship and the Mi Max 2. It won’t be wrong to say that many fans would be very happy to hear this news. What about Max 2 and Mix 2? No it will be about 50k. Count down start in mistore website. Mi 6 a True Flagship Killer! I just hope they price it reasonably! Under glass fingerprint sensor? Miss leading image text. What is the the link of their office website?